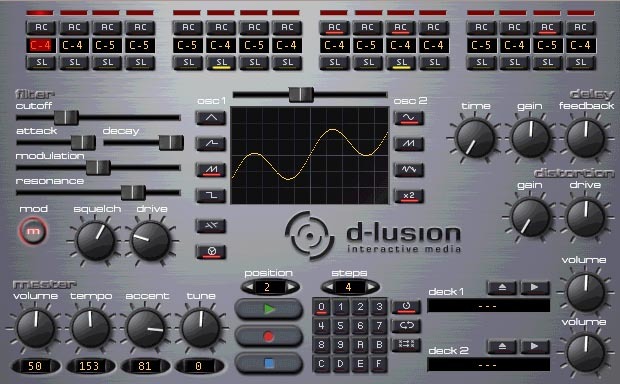 History of d-lusion. Rubberduck help - Intro. now that you have heard about the thrilling possibilites of this software you probably want to start right now. after you have completed the soundcard setup you can indeed get some fancy sounds very quickly. the fastest possibility to edit a new sequence is probably edit/chaos/notes. after you have done this, just press the play button. if you repeat this, the random generator will give you a different sequence every time you activate it. click on one of the black fields at the top of the program. this is the step sequencer. the field you clicked should now be highlighted in red. every key on your pc keyboard is now assigned to a note similar to a piano keyboard. "z" equals a C, "n" equals an A.
just insert your desired sequence now or if you don't know anything about music, just press some letters and numbers on your keybaord. when you have entered some notes, just press some of the buttons called "SL" (slide) or "AC" (accent). these will directly affect the way the notes are played by the sound generation. now press the play button. you should hear a really weird bassdrum sequence. try to fiddle around with the sliders and knobs to create even weirder sounds. nobody wants to hear a fancy bassline without a kicking drumloop. in the lower right corner of the screen you can hear the groove section marked with "deck 1" and "deck 2". click on one of the load buttons and load any .wav file drumloop file you want. click on play to start the thunder. if your neighbours haven't dropped by yet, thi would be the perfect moment to lower the volume a little bit :). for more interaction try to run DrumStation using RubberDuck. all realtime functions can be accessed directly on the RubberDuck panel either as knob or fader.